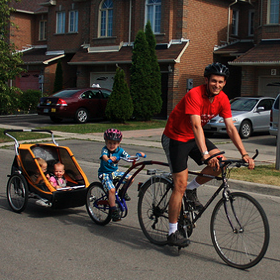 For me, biking my kids to school is a chance to be outside, spend time together (not the same as in a car), and see them develop confidence and a sense of independence. I loved it when my son, after having walked his bike up a certain hill many times, was finally able to get to the top by bike. He was so excited to go home and tell his mom. Getting to school by our own power is an accomplishment we can be proud of. It's a lot of fun too.